I finish packing my BMW 1200GS with just the essentials for a two-night getaway and ride north into darkening skies. A fine drizzle persists as I head up into the mountains, but on this late Saturday afternoon, the sweeping curves of US 129 over Blood Mountain are mine to enjoy, nearly free of traffic. The conditions are perfect for clearing the mind, and totally focusing on the flow of the ride. My destination is a rendezvous with my love, and we arrive within minutes of each other for a quick dinner in Blairsville, Georgia, before heading further north to our stop for the night in Dillsboro, North Carolina. After dinner, we continue up 129 to a short cut on Gumlog road that winds its way east over to Old US 64, and eventually to US 64 at Hayesville, North Carolina. We appreciate the waning beauty of spring in North Georgia with fading purple red buds and snow white dogwoods quickly dropping their petals, even under the stormy skies. Once in the highlands on US 64, the rain begins in earnest, and we stop to add our Aerostitch triple-digit glove covers to our otherwise waterproof gear setup. Despite the steady rain and twilight, we admire the gorgeous pink dogwoods in full bloom along the median of the highway in Franklin. Kudos to the North Carolina highway department for the spectacular roadside displays, which have color for almost every season! As we ascend the mountains above Franklin, the steep and technical curves, while a hoot in good weather, along with the rain, full darkness, and glare of oncoming headlights, mandate a slow and careful approach. 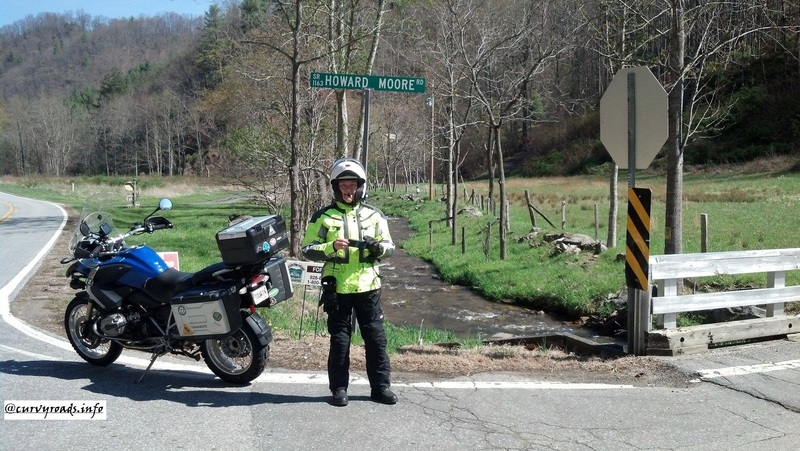 We reach our destination in Dillsboro safely, and anticipate better weather for our next day of riding. The morning dawns foggy, but we have a leisurely breakfast, and 10 miles down the road we have clear blue skies and brilliant sunshine. Coincidence? Or simply a metaphor for my recent shift in mental state? 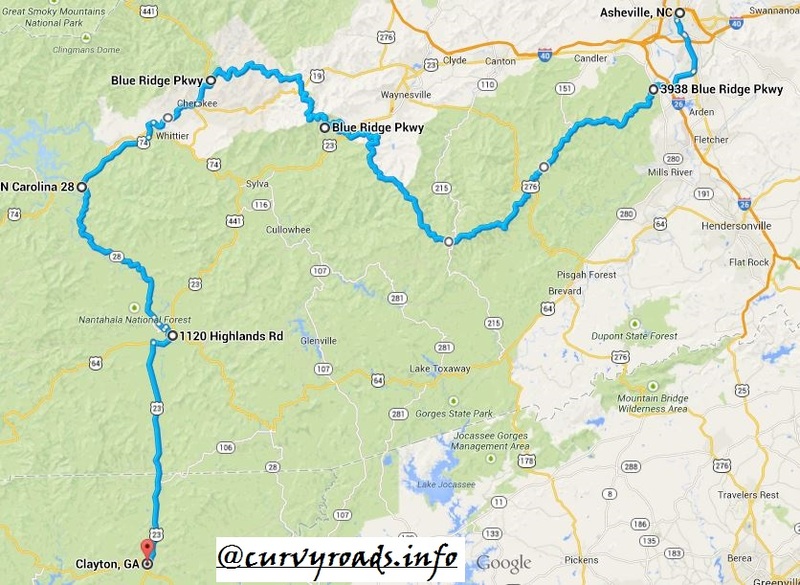 We discuss several routes for the day, but decide on a rambling route, with roads both favorite and new, and no real agenda, other than to arrive in Asheville in time to shower and stroll to dinner. We also decide it will be a “smell the roses” type of day. I translate that to “stop a lot for pictures”! before coming down to meet the French Broad river and the Appalachian Trail, in the tiny hiker burg of Hot Springs. Although you can’t really see it in the photo, Hot Springs is abuzz this day with Appalachian Trail through-hikers getting provisions, as well as, city folk out enjoying the spring weather. Departing Hot Springs, we follow the spectacular winding four lane that is US 25/70 to the next gem of a back road, NC 208. 208 continues the rambling feel, twisting and winding along crystal clear branches, rising and falling with elevation changes, until it meets up with NC 212, where we head toward the great State of Tennessee. 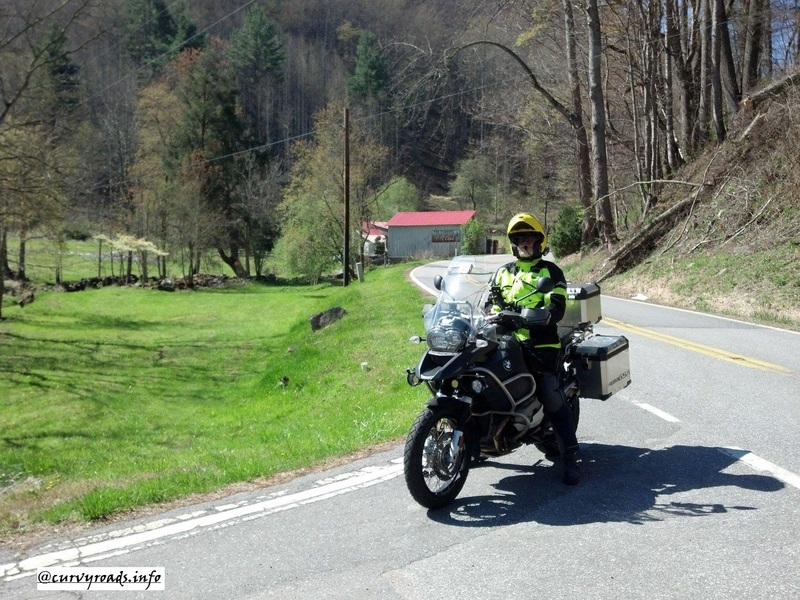 We realize as we ride that unlike some trips, where we have a strict timetable, we are truly enjoying the journey, savoring each beautiful dogwood or bright forsythia, and living in the moment. Ah, this is how it should be; a look to our future via a mini-RTR (if you are not familiar with this recently coined term, you can read about our RTR here). As we climb on 212, we spy a waterfall cascading down the mountain off to the right side of the road. Magically, a gravel pullout appears, and we zip in. 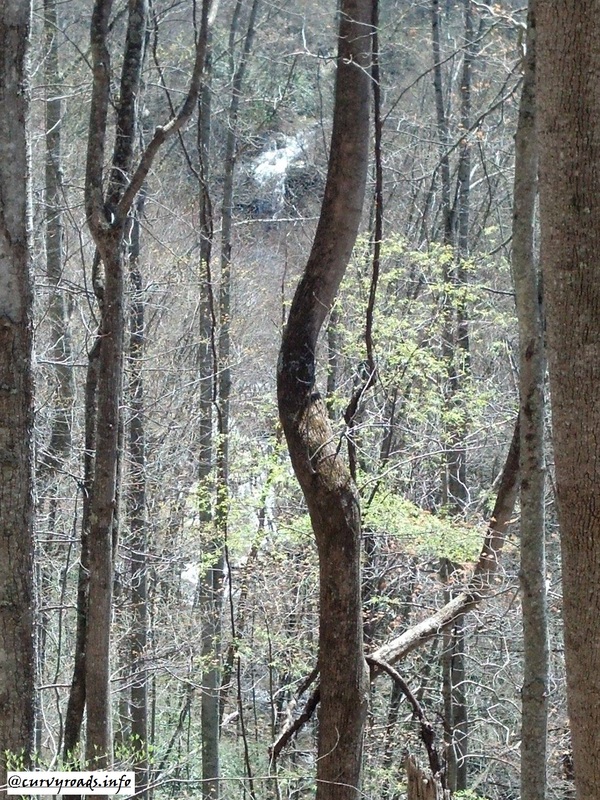 Even though the leaves have not really popped out yet at this elevation, the waterfall is elusive in photos, and only one (of many) shots even partially shows the natural wonder, just above the crooked part of the tree. As we walk back up the road to the bikes parked in the pull out, another shot begs to be captured; our favorite aspect of mountain riding, the ‘curvyroads’ sign. NC Hwy 212 becomes TN Hwy 352 at the state line, but the well-maintained road with fluid curves and little traffic remains constant. We eventually pass under Future Interstate 26, and meet up with US 19W heading south, which is a new experience for us, and a delightful one, with a narrow, tight, roller coaster ride over several mountain gaps, bringing us back into North Carolina. After the excitement of 19W, we meet up with the more business-like US 19E, and dash into Burnsville to fill the tanks for both bikes and riders. After lunch, we head south down I-26 for a few miles, then take NC 213 west to US 70 South, just long enough to reach NC 251, one of our favorite roads to approach Asheville. 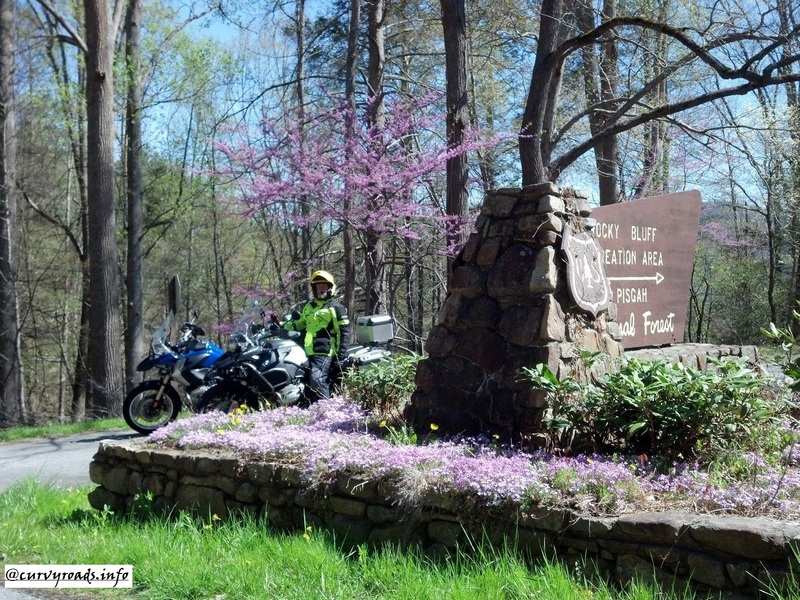 251 is a peaceful two lane road frequented by two-wheelers, both gas and human powered, which rolls along the French Broad River. The river is always incredibly scenic, and on this day it is swollen with recent rains and flowing briskly. At 3:41 PM on this lovely stretch of road, my 2008 1200GS hits a milestone, captured here for posterity. The river delivers a final dose of serenity as we near the Asheville city limits, before we hit the bustle of main streets to reach our home for the evening, the Hotel Indigo. Part of the IHG Hotel Group, the Indigo has the perfect vibe for Asheville, a great combination of sustainability, modern décor and location, location, location. It is pricey, but as IHG rewards members, we are able to redeem points for our stay. Once the bikes are safely parked for the evening in the underground parking garage, we wind down our wonderful day of riding with cool adult beverages while enjoying a spectacular sunset over the mountains. Sunset is followed by a lovely dinner of tapas at Marketplace restaurant; we find the sharing of small plates to be as much an enjoyable experience as nourishment. We cap off the evening by strolling through downtown under a crystal clear night sky, and back to the hotel. The next morning delivers another bright, sparkling sunny day, and we enjoy a great breakfast in downtown prior to packing the bikes and heading out on our ‘long way home’ route for the day. 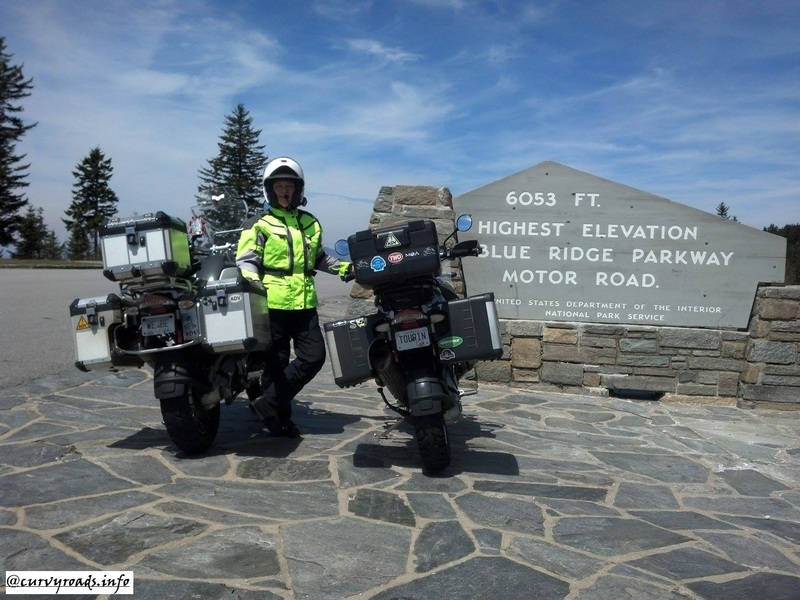 We have decided to revisit the Blue Ridge Parkway (BRP), and follow it south from Asheville, to its terminus at the Great Smoky Mountains National park. 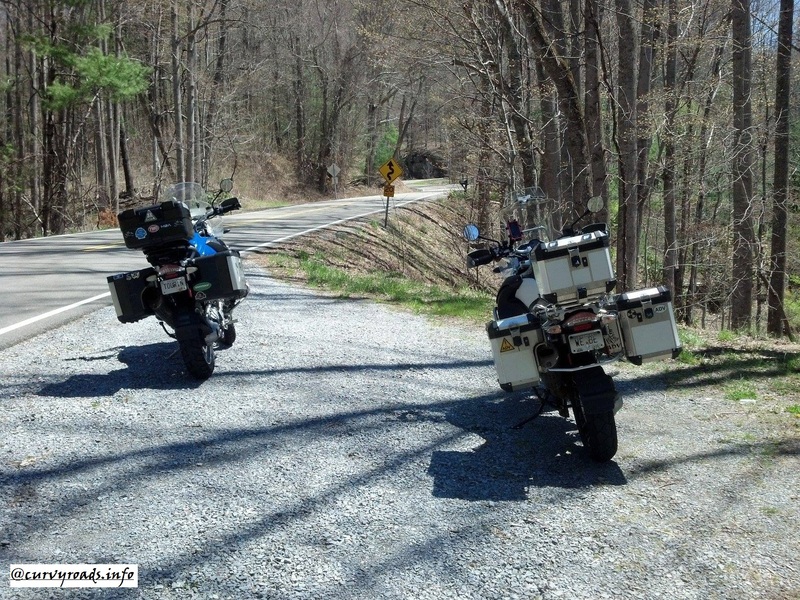 The southern portion of the BRP is absolutely the most exciting, with much more technical and plentiful turns, as compared to the northern portions. 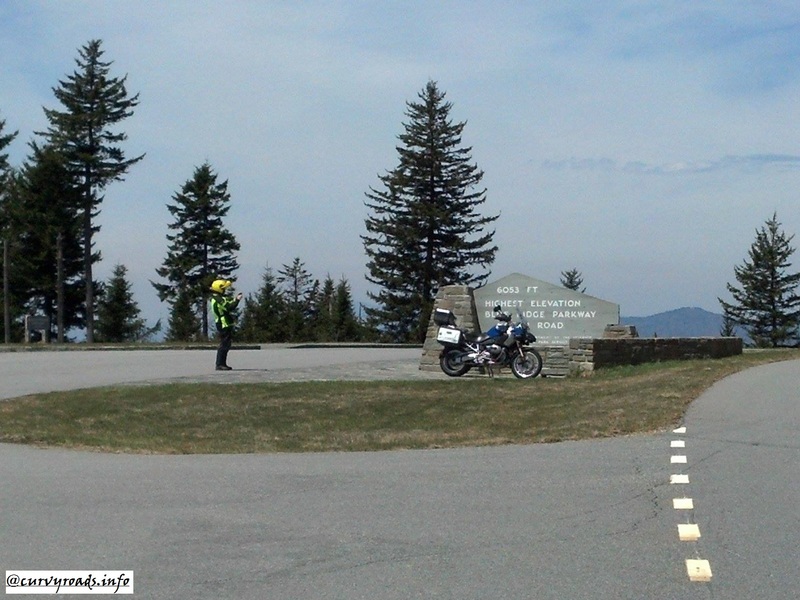 This unique National Park, one of the most visited, is a motorcyclist’s dream, as long as you can keep the speed down to somewhere near the posted 45 MPH limit! There is no commercial traffic allowed on the BRP, and the only real hazards are the many tourists in slow moving cars. We are fortunate that today is Monday, and the traffic is much lighter than on a weekend. A few words of advice to the uninitiated: defy your impulse to simply *ride* the BRP, which can be tough since the road is well maintained and the curves are seductive. 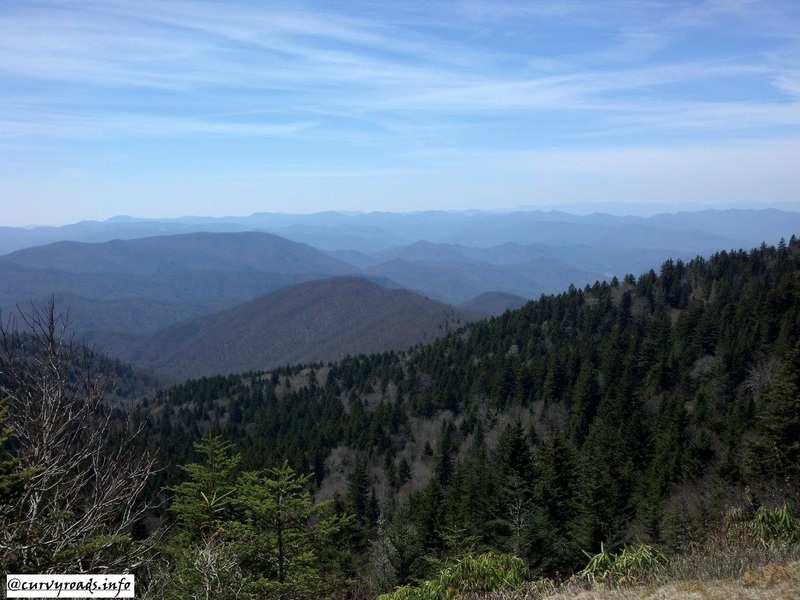 Take the time to stop at some of the many overlooks, as the expansive mountain views are beyond description. In contrast with spring having already faded in North Georgia, at 4000 – 6000 feet in elevation, spring has not yet arrived to the BRP highlands. 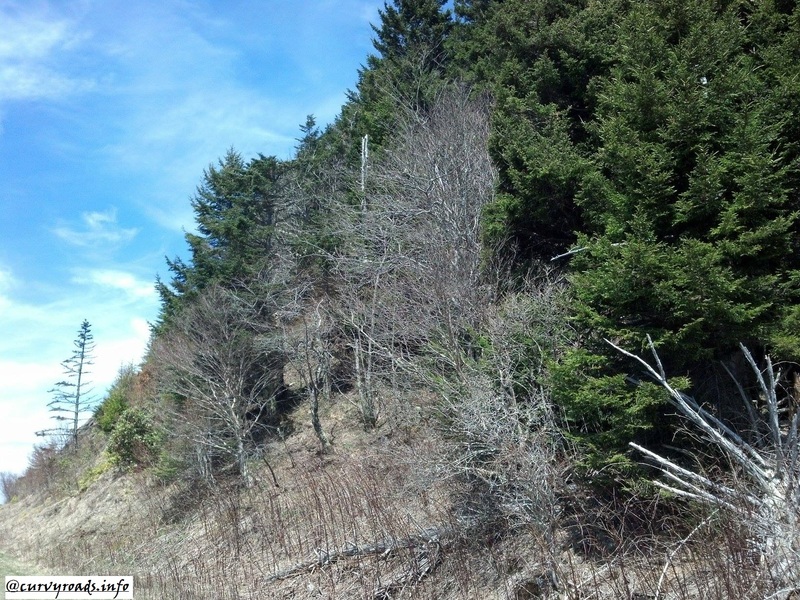 I am particularly struck by the ghostly appearance of the deciduous trees near the parkway’s highest point, which have not yet begun to leaf. 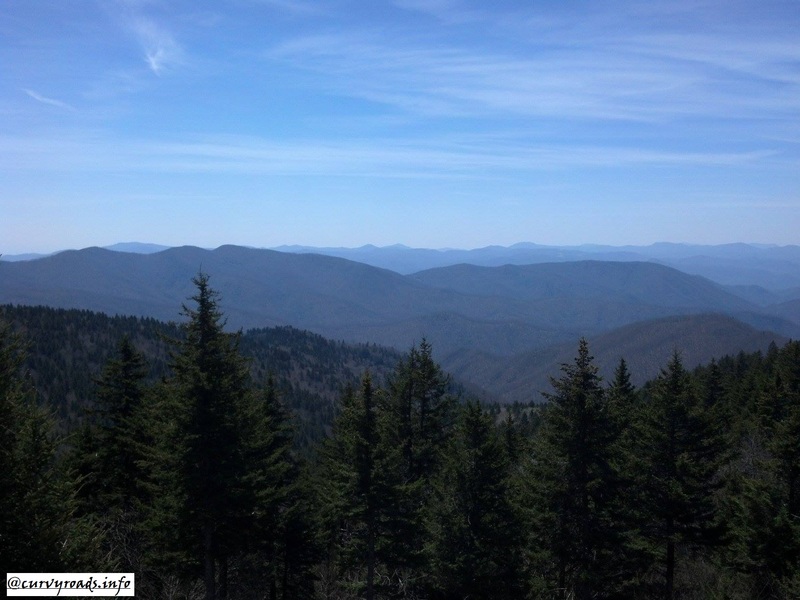 After finishing our photo op at the parkway’s highest point, we continue down the parkway, losing elevation and experiencing a flash forward to spring with fully leafed trees and warmer temperatures as we approach Cherokee, North Carolina, home of the Eastern Band of the Cherokee Nation. Cherokee is a colorful, town that caters to tourists seeking history, culture, crafts, gambling, and outdoor fun, being a gateway to Great Smoky Mountain National Park. Today, Cherokee offers sustenance to two hungry riders, and we enjoy lunch outside on a deck with a crystal clear and noisy stream running below it. Our healthy lunch is followed by a decadent piece of homemade coconut cake, and we are ready to hit the road again. 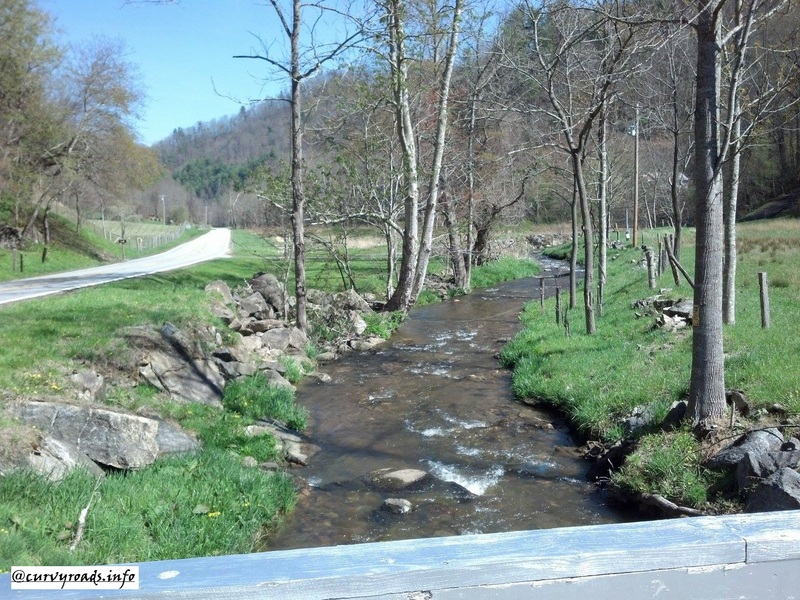 We head south toward Bryson City on US 19 along the Oconaluftee River, well known to trout enthusiasts who come from miles around to fish. 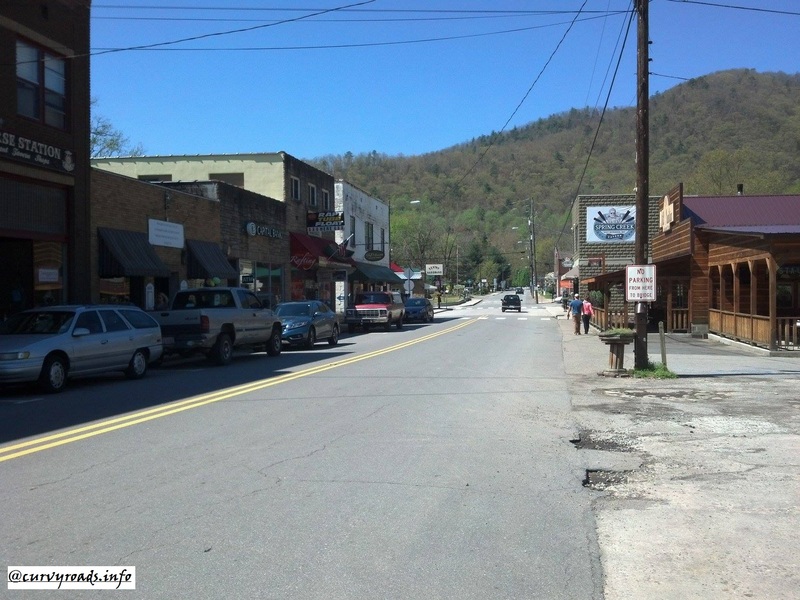 Along our route, the Oconaluftee merges with the Tuckaseegee River and together we reach Bryson City. At this point, we leave the peaceful waters to join the Great Smoky Mountains Expressway (aka US 74) for a few miles, until we reach NC 28 South, toward Franklin. 28 South is another roller coaster of a road, delivering at least as many curves as the famed Dragon’s Tail portion farther north, but with far less traffic. On this Monday, we are alone on the road, and we lose ourselves in the simple joy of the ride. Before we know it, we reach Franklin, having come full circle in just two days, and enjoyed every moment. We agree to make tracks from this point, and take the four lane down to Clayton, Georgia, before winding our way home to take advantage of a few hours of downtime prior to the start of the work week. Have you had a similar trip that just took you away from your routine and your work-a-day worries? Nice ride Roby, I was almost leaning into a few of those curves there. Where’ve you been dude? 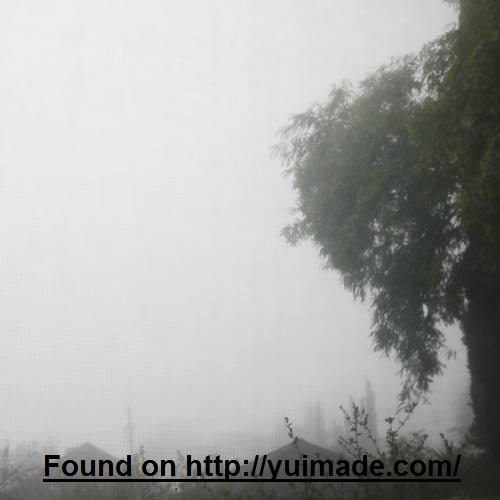 The blogosphere is not the same without you! Hahaaa, you’re very sweet, Roby, I don’t think drastic measures are called for just yet though…we will see. I think I’m back…not sure haa! YES! You ARE back…just left you a comment…great new post, you stated what so many of us think, RD. And stated it so well. RD, thank you for coming by to say hi! Seeing the email notification made me smile, and I needed that on a Monday! Yes, I truly have been in hiding, certainly as far as writing goes. I have a couple of posts in draft, but just can’t seem to get them done. I have done a bit of reading, but can’t keep up with that either. I have missed your wit and honesty on your blog, that is for sure! We will both come out of this, I am sure. Right??? Wow! What a great ride I felt like I was right there with you with the wind blowing through my hair. I love the Blue Ridge. Thanks for your lovely comments on my blog. I appreciate them. Lynn, thank you for the great comment! It is wonderful to hear this from a non-rider especially. I saw a preview of your latest post, and I can’t wait to hear about your adventures with the new boat! Nancy, it was fantastic, even though it was short. It really felt like we got away from everything. So awesome. PS: the comments give some of the evolution of the posts too. thanks for the link. I’m going to bookmark it for when I have some time to relax and dive in. I look forward to your thoughts on the story…have a great weekend! What a beautiful post! You had me on the edge of my seat reading about the first night of your get-a-way! Yikes, I can’t even imagine riding in that weather. I got my motorcycle endorsement on license as a birthday present to myself and my ex bought me a 93 Harley Davidson Fatboy with only 10,000 miles on it. She was beautiful, and I liked riding, but I was always a little nervous. 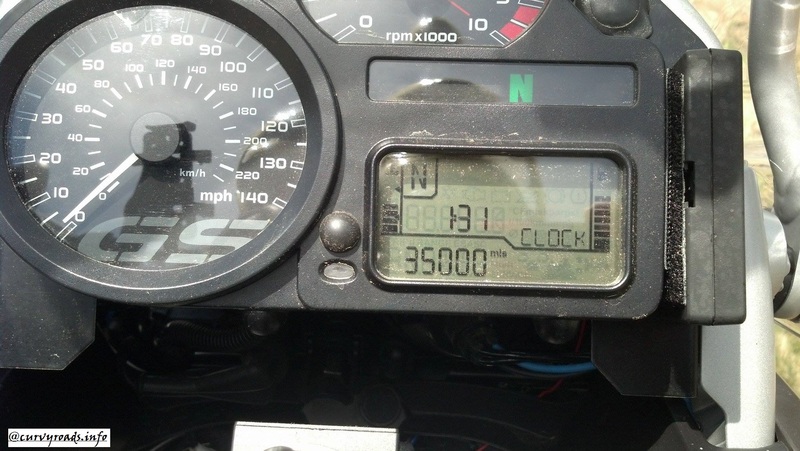 😦 I ended up giving it back to him when we parted ways, after only putting about 1,500 miles on. 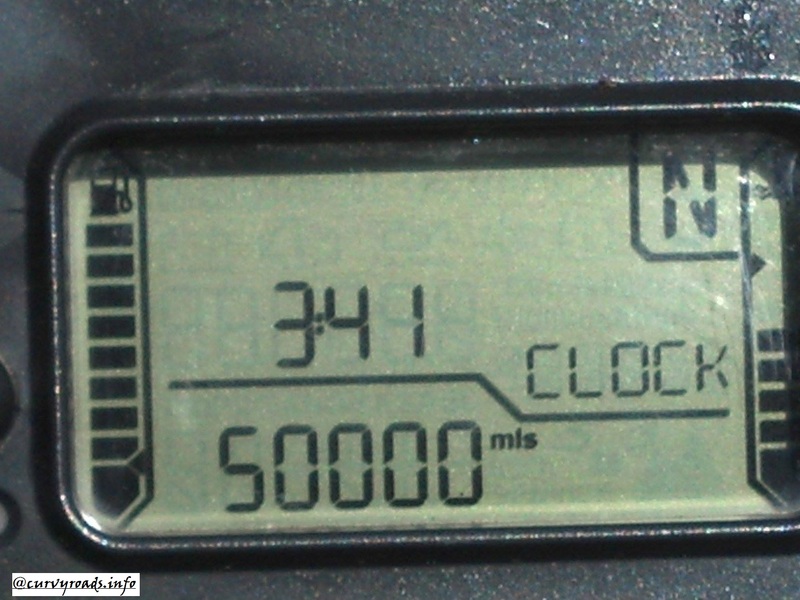 Seeing your milestone of 50,000 miles is truly inspirational, congratulations!! Best wishes for many many more safe miles, milestones and memories. One of the reasons I started a blog was to explore why I love riding as much as I do, why it has become such a huge aspect of my life, and why others try it and find it’s not for them. Your story echoes others I have heard, that you enjoyed it, but always felt it somehow wasn’t right, or caused too much fear to really be enjoyable. I really appreciate you sharing your experience here! What a trip through an amazing landscape. So glad you included the maps as I was clueless. Amazing. Shelley, I am glad you liked the maps. I wasn’t sure if they were worth it, so thank you! It is truly one of the most beautiful areas I have been in. And please do write part 4! Nancy, it was funny, but both REDdog and Beth immediately said “is it ok if I call you Roby?”. Doesn’t bother me, of course it’s ok! You know how to live, my friend. …get out on the highway…:-) Nice to see you here my friend. Oh what an excellent adventure!! Oops just seen that we weren't friends on facebook!! Now how can that be? lol 😉 Okay sent you a friend request when you accept will make sure to send you those! Only cuz I don't know how to get them from post to blog!! 😉 Okay gonna try something but do let me know if this works!! You might have to copy & paste into address bar…not sure!! Sounds like a beautiful ride! Gah, this makes me long to get outside and see something amazing. How amazing – those photos are spectacular! I love “smell the roses” travelling days – they are the best!